Fiendster Jeffrey and I just did the “Jinx!” thing on Twitter, having both noticed that @thatpuzzleguy Tyler Hinman and @rexparker Michael Sharp both tweeted about Clarkson almost simultaneously. (Tyler meant Clarkson University, a hapless hockey rival of his alma mater, RPI; Michael was talking about singer Kelly Clarkson.) 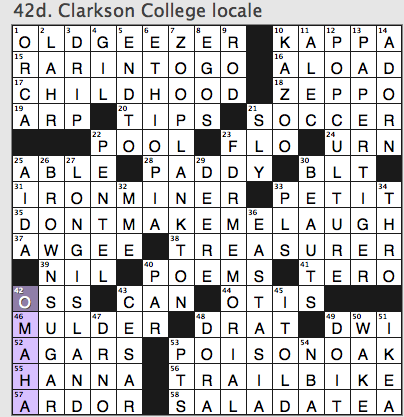 So imagine our surprise, mere minutes later, when we solve this puzzle and encounter 42d: [Clarkson College locale], OMAHA, and head to Twitter to mention 42-Down (@XwordJeffrey got there first). Then Jeffrey notes that the Wordplay blog quotes BBC star Jeremy Clarkson of Top Gear. Patricia Clarkson, honey, your publicist needs to be doing more for you. Anyway! Fun puzzle. This 72-worder brings the goodies: OLD GEEZER has not been RARIN’ TO GO so much since CHILDHOOD. DON’T MAKE ME LAUGH! Watch out for POISON OAK while riding your TRAIL BIKE. The Stones’ BROWN SUGAR, LONG ISLAND, Scrabbly ZOOPLANKTON, consonant-pileup FDR MEMORIAL, Scrabbly KAZOO, POP CULTURE, and a PAPER TIGER round out the juicier long fill. 1a. [White-whiskered sort], OLD GEEZER. I thought of walruses and whatnot before I thought of look-alike Wilford Brimley. 10a. [Symbol of Einstein’s gravitational constant], KAPPA. 21a. [What head shots are used in], SOCCER. Not photography head shots. 23a. [Eddie’s partner in musical comedy], FLO. Wha…? 46a. [Fox on Fox], MULDER. On The X-Files, back in the day. 53a. [Toxicodendron diversilobum], POISON OAK. I can’t be the only one who leapt at POISON IVY and felt clever, right? 1d. [400-pound calf, perhaps], ORCA. Orca awards! 4d. [Drug czar Kerlikowske], GIL. 11d. [“I’ll Be Around” songwriter Wilder], ALEC. Who? 34d. [Sno-___ (winter blower brand)], THRO. Never heard of it, but it makes sense. 40d. [One of nine numbers on a card], PAR. Golf scorecard, not playing cards. 48d. [“Cannery Row” brothel owner], DORA. So that’s where Dora the Explorer got her name. 31a: [One working with magnetite], IRON MINER, is kinda dull. But then it’s right next to 33a: [Minor, legally], PETIT, and I like the MINER/minor echo. 40a. [They often have good rhythm], POEMS. Yes, it’s true. Poems can dance. Except haiku. All they can do, really, is sway dumbly to some blues or reggae. 9d. [Bygone means of corporal punishment], KAZOO. That would be a great clue/answer pairing, right? 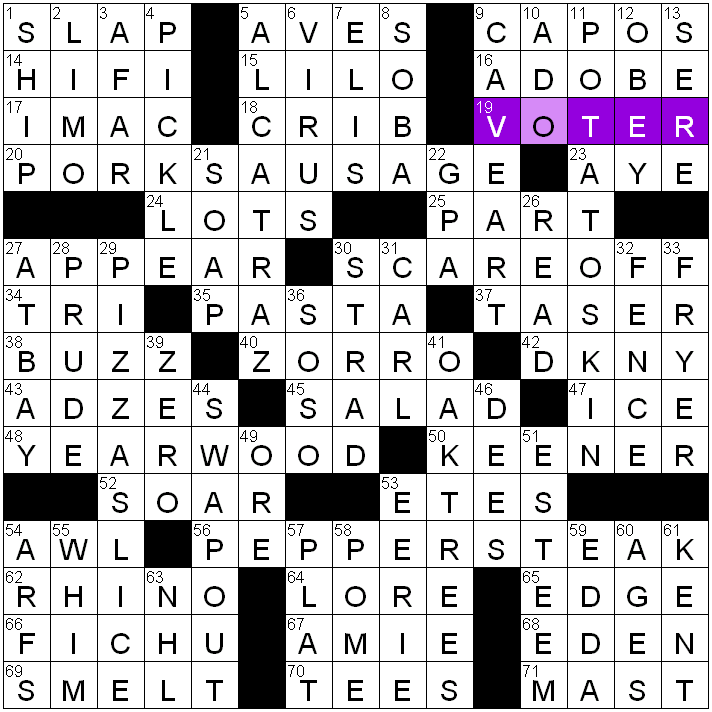 Alas, that clue goes with ROD, and KAZOO’s clue is 10d: [Buzz generator]. Four stars. The fill is quite good, isn’t it? 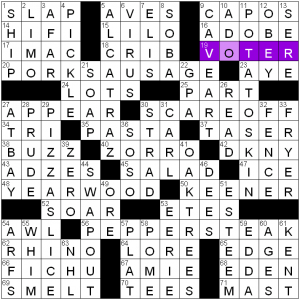 One aspect of crossword writing that Patrick especially excels at is finding a new angle to a familiar idea. The familiar idea here is using diagonals to conceal entries; the new angle, which is both elegant and subtle, is to have the X’s in the grid serve as diagonally-oriented hyphens in the hidden entries. In Patrick’s execution there are three X’s in the grid and four concealed entries, one forming the NW-SE axis and the other three crossing it pointing northeast. The long diagonal spells out TOPXOFXTHEXLINE, while the three crossers spell REDXHOT, KILLERXDILLER and FIVEXSTAR. 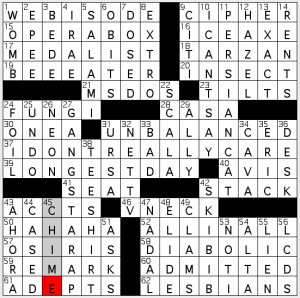 Each is clued parenthetically on the same square where another clue just happens to begin, so FIVE-STAR is clued at 72-across, which is FARE, as [Travel expense: (NE: Exceptional, say)]. Those three X’s (the only ones in the grid, of course) multitask nicely as hyphens oriented along those diagonals. This is an extremely impressive construction. The concept of using the X’s this way is novel (to my knowledge), logical and clever. The execution of the concept must have taken a long time to get right: he’d have to decide how many X’s to include; then how and where they should be logically placed; and, after he’d decided on three X’s and four words and the pattern of one long entry crossed by three shorter ones, he’d have to choose the hyphenated words and fill the grid. Diagonal grids are notoriously difficult to fill, and one with this many diagonal words must have been challenging (84 words in this grid). But the fill was kept reasonable (and even above-average in the SW corner) which is all that’s required when the bar is set this high. Another subtle but important decision Patrick had to make was how to hint at the presence of the diagonal entries. Starting them on the same square where another clue starts, and giving their definition and direction, was the right amount of nudge. And when the four hidden entries emerged from the grid it all seemed so obvious (but only in retrospect). One of my favorite puzzles of the year so far. Great concept and great execution don’t always inhabit the same crossword but here they did. 4.80 stars. Bravo. Hi all! On this week’s WEBISODE of Andy blogs the Saturday LAT: UNBALANCED, DIABOLICAL LESBIANS take an ICE AXE to the OPERA BOX! ALL IN ALL? I DON’T REALLY CARE. Next, on NET TV! 19a, BEE-EATER [Bird that dines on stingers]. Just the thought of anything eating bees makes me gag a little. In case you were curious, bee-eaters smack insects that have poisonous stings on a branch, then they close their eyes and rub the insect to discharge the venom. The birds don’t actually eat the stingers of the insects, but insofar as insects that sting can be called “stingers,” the clue is accurate. 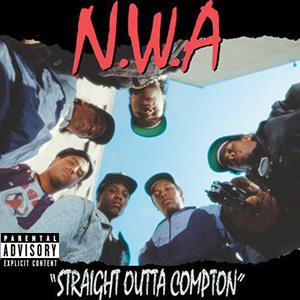 27d, GANGSTA RAP [“Straight Outta Compton” genre]. N.W.A. has a lot of things to say about the police, not many of which I can reproduce here. Straight outta Compton… and straight into my heart. 39a, LONGEST DAY [1959 Cornelius Ryan best-seller about the Normandy invasion, with “The”]. Never read it or seen the movie, but with a cast that includes Sean Connery and Gert Fröbe, I’m just going to assume it’s Goldfinger: Normandy Edition. 42d, SKI BIB [Apparel for the slopes]. For when you eat ski lobster. HA HA HA (I’ll leave it to you to determine whether our fearless constructor meant for the clue [Hysterical] to be taken sarcastically or not). 1a, WEBISODE [Installment in a modern series]. I have a strong aversion to the word “webinar,” but strangely I don’t find WEBISODE nearly as irksome. They’re both fairly pointless portmanteaux. 37a, I DON’T REALLY CARE [“Whatever”]. Also the title of a track by the ever-delightful Waka Flocka Flame. 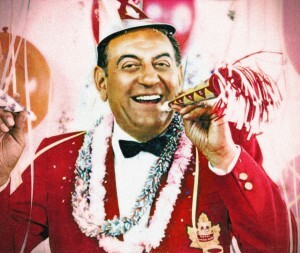 Guy Lombardo clearly doesn’t care. 62a, LESBIANS [Many characters on “The L Word”]. Spoilers await anyone who clicks on the following link, showing the intricate web of relationships formed during the show’s run. 10d, I CAN’T SAY [“It’s hard to tell”]. It’s especially hard to tell when you’ve got laryngitis. I really, truly enjoyed this puzzle. The 8×4 stacks are both pretty (the acrosses more than make up for the iffy EXTRO-, ALTA., and LCDS). I found the cross-referenced TEE SHIRT and V-NECK satisfying when I figured them out. And the grid is just so sparkly: WEBISODE, CIPHER OPERA BOX, ICE AXE, TARZAN, FUNGI, V-NECK; the consonant-heavy MS-DOS next to the rare triple-letter-in-a-row BEE-EATER; the conversation-unto-itself “I CAN’T SAY” / “I DON’T REALLY CARE” crossing; EPEE nearly on top of FOIL. Gotta knock some stars off for the partials and abbreviations, so we’ll call this one 4.25 stars. Until next week! Just six days until the ACPT and I clock in with a solving time of more than eight minutes–and it’s not even the Sunday Challenge! Maybe I’m just getting all the slowness out of my system now. Sure, I’ll go with that. 20-Across: [Chorizo, for one] is PORK SAUSAGE. Speaking of pork sausage, a few months ago I used this recipe for the “Bacon Explosion.” It’s well-named. And as soon as my cardiologist gives me the go-ahead, I’ll make it again. Estimated date: mid-2015. 35- and 45-Across: PASTA / SALAD is the [dish often topped with Italian dressing]. That’s a fun way to use an unpaired 10-letter theme entry! I love the creativity. 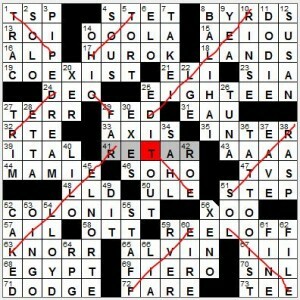 56-Across: PEPPER STEAK is the [Chinese beef dish] that I had a harder time sussing out. I guess I don’t think of pepper steak as a Chinese dish; maybe I’m influenced by the fact that the only Chinese food we ever get in crosswords is General TSO’s chicken. 11-Down: The [“Loaded” appetizer] is a POTATO SKIN. So yummy, yet so poisonous. 29-Down: A PIZZA SLICE is indeed a [Piece of a pie], though since I came to this corner fairly early on (before getting the theme) I kept wanting some answer that related to pie charts. Damn you, business meetings! That’s a nice amount of theme density, yet the grid also offers some nice treats like ALCATRAZ (clued as [“The Rock”], though that made me want to try DWAYNE JOHNSON), OAK TREES, the [Acorn sources], BUZZ, PICKLE, and Trisha YEARWOOD. My hang-ups came in the northeast and southwest corners.The main mystery in the southwest was FICHU, the [Triangular kerchief] that, not surprisingly, is not a part of my wardrobe. I had YAPS instead of ARFS as the [Barks in comic strips] crossing there, so that didn’t help. Up in the northeast, I had no clue for the answer to [Lascaux find]. That turned out to be CAVE ART (sure). I might have figured it out sooner had I tumbled to the answer to the crossing [Booth user, perhaps] (VOTER). When I saw “Booth” all I could think about was Seth MacFarlane’s joke about John Wilkes Booth at last weekend’s Oscars. Oh, and the crossing SERE was likewise a mystery for the longest time. 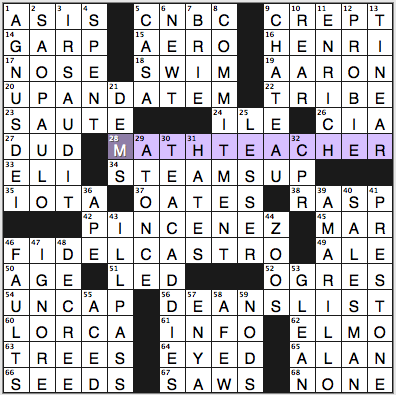 Let’s hope this answer to [Dried and withered] won’t be on any of the puzzles in Brooklyn–I need a fighting chance! Favorite entry = SWAP OUT, clued here as [Switch]. Favorite clue = [They may be drawn] for LOTS. Is it just me or was this puzzle really tough? When all was said and done, I couldn’t declare anything unfair or out of bounds. Tough clues, is all. 5a. [”News” Store at many airports], CNBC. Why is the “S” in “Store” capitalized? What do they sell at CNBC stores? 20a. [Words spoken while shaking], UP AND AT ‘EM. While shaking someone awake? 22a. [Category between subfamily and genus], TRIBE. News to me. 28a. [Olmos role of ’88], MATH TEACHER. Figured we needed the character’s name. Wasn’t it Jaime something? Yes, Escalante. 35a. [Entry on J’s family tree], IOTA. I don’t understand this at all. The letter J, related to the Greek letter iota? 42a. [TR trademark], PINCE-NEZ. I could only think of Teddy Roosevelt’s ‘stache. Slightly misleading to have the initials when the answer is not abbreviated in any way, no? 46a. [”Guerrilla Prince” subject], FIDEL CASTRO. Makes sense. 62a. [Billy, in Bologna], ELMO. Huh. Short for Guglielmo. 5d. [”On the Balcony of the __ Rosada” (”Evita” tune)], CASA. Musical theater is not my bag. 12d. [Rookie firefighter], PROBIE. In a probationary period. 13d. [Verbal insensitivity], TIN EAR. The “verbal” part of the clue had me thinking of words, not music. But you can be non-literally tone-deaf and manifest it by saying/writing insensitive things. 41d. [Sister brand of FRAM], PRESTONE. Here’s Ella Fitzgerald and Louis Armstrong duetting on “The Frim Fram Sauce” in 1946. I know it from this CD, Ella & Friends. 40d. Drummer or pitcher], SALESMAN. Drum up sales with a good sales pitch. The fill: I’LL PASS, MATH TEACHER, FIDEL CASTRO, PINCE-NEZ, DEAN’S LIST yes, IRS AUDIT no. Four stars from me for this beat-down. This entry was posted in Daily Puzzles and tagged Barry C. Silk, Julian Lim, Patrick Blindauer, Raymond Hamel, Stanley Newman. Bookmark the permalink. Yeah, good fill but lacked a fun, or any other, factor for me. I’m mystified by “one of nine numbers on a card” for PAR. This is not a clue a golfer would have written or approved. Most courses are 18 not 9 holes; but beyond that almost every card lists the total par for each nine and (if 18 holes) for the course; so an 18 hole course will have 21 par numbers and a 9 hole course will have 10 par numbers. And let’s not even bring up the fact that many cards also list ladies’ pars which can be different than men’s pars. Bottom line: I have never seen a card with 9 par numbers. I have seen cards for 9-hole courses with 10 and 20 par numbers. Andy, is that G Lombardo image going to be a regular thing? Don’t make me get all Lawrence Welky on you. Loved the Silk for all the points mentioned earlier, but did love the two technical clues from different branches of science (KAPPA, POISONIVY/OAK). Sat with IVY for two long until IKEA popped up. 5 stars! Did not expect to see another stunner this day until I visit the PB site – that was a masterpiece only because I first saw only the long diagonal and was disappointed that there wasn’t more. Of course, I went back to the other parenthetical clues and found the rest of the diags! Holy smokes – a tour de force. 5.5 stars! So an ICEAXE is used to make a crack big enough to get one’s fingers into. And ADEPT as a noun is an expert. Just as a quibble, for “purchase” I’d venture it doesn’t require getting a part of a human body on or in it. The ice ax itself, or an inserted piton, is enough. More expansively, I feel “purchase” can be more or less synonymous with “traction,” so a car might struggle to get purchase on a gravelly road. In any context, the root meaning of “acquire” or “obtain” is still discernible. Thanks for the rave reviews on my latest website puz, Matt and AV! So glad you liked it. It started as a possible ACPT submission, but I did something with directional words last year so I held onto it. I went through a couple of titles: “Hyphen Nation” and “Unlevel Best” were my two favorites, and I debated whether to add circles or shading and opted against it. More and more I’ve come to suspect that the greatest enjoyment for solvers is the surprise that comes from an unassuming puzzle, one that doesn’t show its hand too soon. Major DNF on the stumper, especially on the, um, northern hemisphere. Kudos to Patrick B. for giving us this paragon of puzzle prestidigitation, which I did manage to finish. NYT was brilliant was red herrings, most of which I fell for. I started with OLD CODGER (instead of OLD GEEZER). Then figured that PTS would matter in the NFL (instead of NBA), which led me to believe that TRAIL FORK (instead of TRAIL BIKE) was the off road option. I also thought that HARPO not ZEPPO was the famous brother, SNO-THRU (not THRO) was the snowblower, and that the buzz generator was a RAZOR instead of KAZOO. I love being led astray. Tough but fair puzzle.